One main task in evolutionary multiobjective optimization (EMO) is to obtain a suitable finite size approximation of the Pareto front which is the image of the solution set, termed the Pareto set, of a given multiobjective optimization problem. In the technical literature, the characteristic of the desired approximation is commonly expressed by closeness to the Pareto front and a sufficient spread of the solutions obtained. 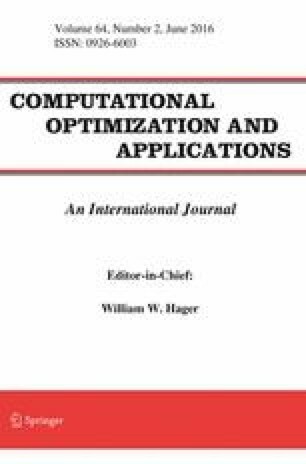 In this paper, we first make an effort to show by theoretical and empirical findings that the recently proposed Averaged Hausdorff (or \(\Delta _p\)-) indicator indeed aims at fulfilling both performance criteria for bi-objective optimization problems. In the second part of this paper, standard EMO algorithms combined with a specialized archiver and a postprocessing step based on the \(\Delta _p\) indicator are introduced which sufficiently approximate the \(\Delta _p\)-optimal archives and generate solutions evenly spread along the Pareto front. HT and CG acknowledge support by the European Center of Information Systems (ERCIS). OS acknowledges support from Conacyt Project No. 128554. CDM acknowledges support by the Consejo Nacional de Ciencia y Tecnología (CONACYT). All authors acknowledge support from CONACYT Project No. 207403, DFG Project No. TR 891/5-1 and DAAD Project No. 57065955.